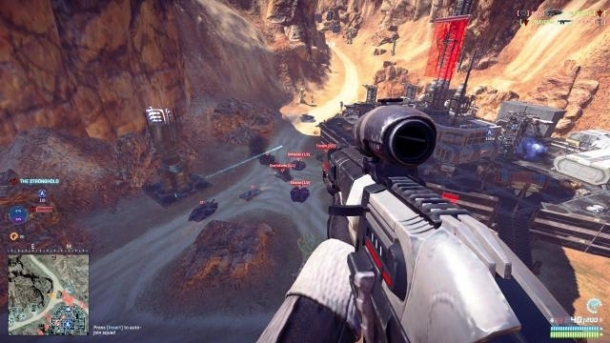 Welcome to the PlanetSide 2 Walkthrough where our team of contributors will help you work through the game via a step-by-step tutorial. A Gamewise walkthrough aims to take you all the way through the game to 100% completion including unlockable quests and items. If you are stuck on something specific and are unable to find any answers in our PlanetSide 2 Walkthrough then be sure to ask the PlanetSide 2 Forum / Community for help and advice in the discussion box below and they will get back to you as soon as possible with an answer! Finally, if you have been playing PlanetSide 2 and wish to help other users, feel free to sign up and start contributing! Across the continents of Auraxis, thousands of players will come together in enormous battles to win control of critical territories and key resources for their empire. With a an extensive skill tree and free-form class-based system, players will be able to customize their soldier, weapons and vehicles to match their play-style, as well as the needs of their squad, outfit or empire. Battles can last for days or weeks, so players will need to build alliances and specialized combat outfits to take on long-term strategic and tactical initiatives. With air and ground combat, the battles will be larger and more intense than ever. Which PS4 launch game are you most excited about?